One might argue that laptops aren’t particularly useful for gaming and that you’re better off spending money on a regular desktop computer instead. Usually, I’m even inclined to agree. However, having a portable setup with a decent amount of horsepower to run the latest games fluently provides a ton of benefits and most recent gaming notebooks even carry the same GPU chips which means you get the same fast and fluid performance. Think about it – it’s a single device where everything just works. A beautiful display, super speedy solid state drive and plenty of additional storage for additional games. Combine those features with a beefy CPU and GPU combination and you’re playing with a whole lot of power. Their portability also makes for the ideal virtual reality stations. If you’re currently in the market for a gaming laptop you’ve probably noticed there are bunch of different devices available, and it’s pretty tough choosing the right model for you. Do you prefer gaming on a 15-inch device or will you go for a tad larger with 17 inch? Should I go with a Core i5 or a Core i7 processor and what benefit does a PCIe SSD hold for gaming? How good is this GPU for running the latest games? Is price a factor? A bunch of questions that are pretty tough to answer. Finding the perfect gaming laptop takes time and might require you to do some extensive research. To make things a bit easier, we’ve compiled a list with the five best gaming laptops under 1500 currently available. I’ll also make sure to keep this list regularly updated. If you’re looking for something cheaper, we also have a list of the best gaming laptops under 800 that you can check out, too. Spoiler alert: I’m really fond of the ASUS Republic of Gamers GL-series as they provide a sleek design and a great price-performance ratio and the Gigabyte P57Xv6 if you’re looking for raw power, but be sure to check out the full list of recommendations below. The ASUS Republic of Gamers label is only being used on their top-of-the-line products specially aimed towards gamers and hardware enthusiasts. The GL702 series definitely lives up to this promise with its beautiful 17.3-inch display and more. Powered by one of the fastest mobile processor on the market – the Intel Core i7 6700HQ – truly no task is too much of a hurdle for the GL702. You can expect cutting-edge performance in gaming and CPU-intensive applications such as editing and rendering videos. The star of the ROG Strix is its beautiful and very detailed design. The brushed aluminum gives the notebook a very high-end feel and it doesn’t only look good, it manages to dissipate the heat well, too. The four most important buttons – yep, I’m talking about W, A, S, D here – have been given a special treatment and stand out from the rest of the keyboard. Despite all the horsepower within the device it only weighs in at six pounds and is 0.94 inches thick at its thickest point. An impressive result for a 17-inch powerhouse. Speaking about the keyboard, the keys on the Republic of Gamers series have been given a slight tactile feedback very similar to that of mechanical keyboards. This feedback greatly improves your typing experience and allows for more precise and faster input in games. Gaming in the dark? No problem at all thanks to the red backlight. Let’s talk some more about the good stuff. The GL702 is powered by a GeForce GTX 1060 chip which handles the graphics department. You’ll notice there isn’t any mobile branding indicating a lower performance chip and that’s because the chip inside the GL702 is identical to the ones used in desktop computers. 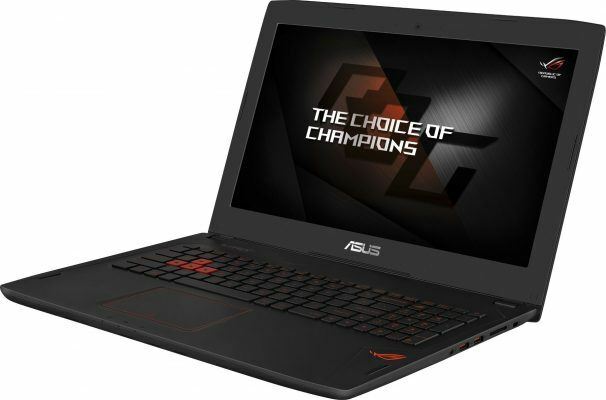 In other words, ASUS has managed to cram a very speedy GTX 1060 6GB chip inside this sleek looking laptop with an attractive design. In order to compensate for the heat, the GTX 1060 is clocked at a slightly lower frequency than its desktop counterpart, but is otherwise exactly the same. The difference in gaming is a few percent tops which is something you probably won’t even notice. In terms of connectivity, ASUS has definitely made sure to keep its laptops up to date. Next to finding your regular ports such as USB 3.0 and HDMI, there’s also a Mini DisplayPort and USB Type-C connector present. What’s the use of a great graphics card if you don’t have a fantastic display to use it on? That’s the same thing ASUS must’ve though when they designed the GL702 series. The display has a Full HD resolution and uses an IPS-panel for the best possible color reproduction. Viewing angles are OK up to 160 degrees. Although TN-panels are generally faster, some will prefer the superior image quality of IPS. And guess what, that’s not even the best part. ASUS has equipped the display with NVIDIA’s G-Sync technology, which perfectly synchronizes the refresh rate of the display with the number of frames provided by the GPU. That means no more jitters and screen tearing, ever. The Republic of Gamers Strix GL702 comes in a whole bunch of styles to make sure you can choose the best model for your needs. The model linked above is the one I’d personally recommend: you’ll get a whopping fast 128 GB NVMe SSD with incredible read and write speeds. Starting Windows and copying files happens almost instantly. Don’t blink or you might miss it. As a gamer, that’s not nearly enough storage for a gaming device. That’s why there’s also a regular 1TB hard drive which can also be upgraded. The amount of RAM on most of these devices is 16 gigabytes which is more than enough for the recent and soon to be released games. If you’re looking to do video-editing however be sure to check out models with 32 GB. However, those usually end up above 1500. You’ll probably notice the striking similarities with the ROG laptop above, and while most of its inner components are identical, it’s definitely worth giving the GL502 a closer look. As I’ve already covered its larger brother – the GL702 – extensively above, I won’t repeat everything over here. The most obvious difference is the smaller form factor of course. The 15-inch body is a lot more portable than its larger counterpart and is also significantly lighter at 4.9 pounds. Battery life remains the same, however, as the smaller display compensates for the smaller battery. What makes the GL502 interesting is the differences it offers in the available options. The standard model has a regular GTX 1060 coupled with 16 GB’s of internal memory and a 1TB hard drive, with an available upgrade slot for an M.2 SSD. If you don’t like installing an SSD yourself, you can go ahead and pick the pre-configured variant with fast 256 SSD + 1 TB combination. Both of these are available for well under $1,500 – but if you’ve got a little more cash to spend, it might be worth checking out the GL502 with a full-speed GTX 1070 graphics card for the best possible performance. This variant also comes with a blazingly fast 256 PCIe SSD. If you’re a little more demanding, that one’s perfect for you. When you’re looking for a gaming laptop, most of the choices you’ll have can be divided into two categories: 15.6″ and 17.3″ devices. Neither are truly portable and sometimes you just prefer having a smaller display with a higher pixel density. Luckily for those type of gamers, MSI has built one of the fastest 14-inch gaming laptops on the market. Let’s start with the design. MSI has followed the design language of its larger high-end devices with an overall black-red color combination and brushed aluminum look. The Phantom Pro does look a bit aggressive and might be a tad less sleek than some competitors, but for a 14-inch laptop it certainly packs a punch. In terms of performance, everything you’d expect to see in larger models can be found in this subtler Phantom Pro laptop. We’re dealing with the very fast Intel Core i7 6700HQ processor coupled with a hefty 16 gigabytes of internal memory. The SSD has a storage capacity of 128 gigabytes which is great for Windows and you can install your games on the 1TB hard drive. Display-wise we’re literally and figuratively looking at a stunning Full HD display with an IPS-panel. Due to the smaller size, the Full HD resolution stands out and provides a pretty sharp gaming experience. MSI also has some nifty software features to help calibrate the color and reduce eye-strain. Unfortunately, there’s no support for G-Sync. Connectivity is pretty good with two full-sized USB 3.0 ports, Thunderbolt and Killer LAN. A USB Type-C connector sadly isn’t present. The main event is a full-speed GTX 1060. The fact that MSI has managed to fit a GPU as fast as this one into such a small body is truly a remarkable feat. The keyboard was built by popular manufacturer SteelSeries and provides a very nice typing and gaming experience. MSI has also outfitted the Phantom Pro with great virtual surround speakers which sound great if you’re not a big fan of headphones. Alright, alright. 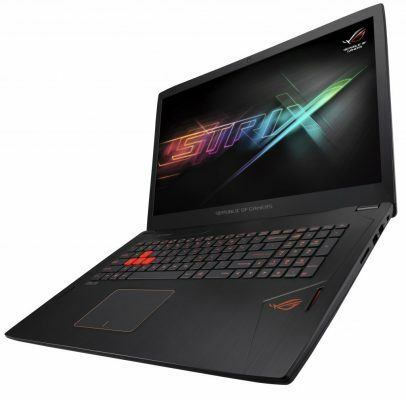 We’ll admit that the GS63VR generally is available with a price tag that’s a tad higher than $1,500 but the slight increase in price definitely allows for a unique gaming laptop. The Stealth Pro is often called the MacBook Pro of the gaming laptops. I can understand that that’s not really something you’d want to be associated with as a pure gamer, but it reflects the extremely sleek and thin design of the GS63VR. At its thickest point, you can only measure a thickness of 0.69 inches and a maximum weight of just four pounds is impressive for a 15.6-inch device. Brushed black aluminum definitely is ‘in’ for gaming laptops and the GS63VR doesn’t form an exception. Build quality is exceptionally good. In terms of internal components this device is fairly similar to the ROG Strix GL502 I’ve detailed above. Make no mistake, the sleek design houses an amazing amount of power. You’re dealing with a top-of-the-line Core i7 6700HQ, a beautiful 1080p IPS display with fantastic color reproduction, a blazing fast 128 or 256 GB solid state drive and a full-speed GTX 1060 6GB. You can also choose between 16 and 32 gigabytes of memory, although the latter model does provide you more bang for the buck overall. This laptop does miss G-Sync which prevents screen tearing. A small caveat is the lack of a USB C-port. The keyboard has been built by SteelSeries and provides an extremely satisfying and somewhat subtle tactile experience. There a very fancy LED-backlight underneath the keys which is also adjustable via software. Although you’re probably going to use a decent gaming mouse, it’s nice to have a large and responsive trackpad as well. The GTX 1060 chip is without a doubt the most popular chip for gaming laptops, and with good reason: the amount of performance it can bring to the table for notebooks in this price range is phenomenal. But what if you’re just a little more demanding, want a little more graphical eyecandy or want slightly higher framerates? That’s where the GTX 1070 comes in. A faster chip that will effortlessly handle anything you throw at it, including intensive virtual reality games. Compared to the GTX 1060, you’re looking at a performance increase of around thirty percent – a very noticeable upgrade. There also 8 GB of video memory available, which is plenty for extreme high-quality texture loading. 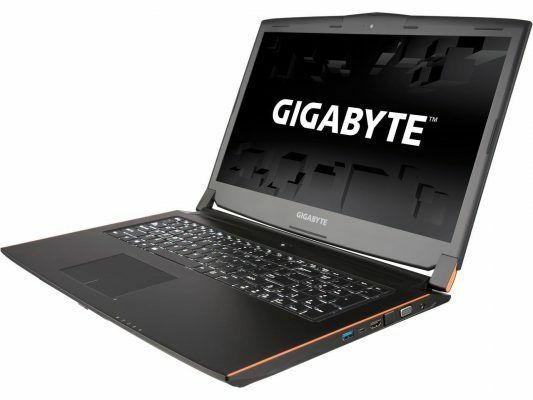 The design of this Gigabyte laptop is a bit subtler and has some similarities with high-end business type notebooks, although you’ll notice the orange color accents, which is a trademark for Gigabyte’s gaming products. The laptop is chunkier and weighs a hefty 6.61 pounds. The keyboard is backlit and features an anti-ghosting mechanism. The other components of this gaming notebook definitely don’t disappoint either. We’re working with a very fast Core i7 6700HQ and 16 gigabytes of internal DDR4 memory. The solid state drive of 128 GB is blazingly fast thanks to the PCIe-interface and you’ll have an additional 1TB at your disposal. It’s also worth mentioning that this laptop does have a DVD reader/writer combination which is something you don’t see often anymore. Don’t need the DVD drive? No worries, you can just swap it out for an extra hard drive space to truly carry a very large library of games with you. The display offers great image quality, sharpness and color reproduction, and features fantastic viewing angles as well thanks to the IPS-technology. Unfortunately, NVIDIA G-Sync is missing from this panel. Connectivity of the P57X is great with an HDMI 2.0 port to connect the laptop to a 4K-monitor or 4K-television as the GPU can definitely handle the extra pixels. Next to all the possible connections you might think of, there’s also a full-speed USB 3.1 Gen 2 Type-C connector which means you’re absolutely ready for the future. Note: The P57Wv6-NE2 is available in multiple different variants, including one with a GTX 1060 for a lower price point as seen here. Although this also is a great device, the variant that really stands out is the one equipped with the vastly superior GTX 1070. It’s also available in a 15.6-inch variant which is identical but misses the optical disk drive. In short, thanks to the GTX 1070 the P57X provides an incredible amount of bang for the buck in terms of raw performance. If there’s a sweet spot in terms of pricing for gaming laptops, it’s definitely around $1,500. You’ll get an incredibly amount of value and a fantastic, fluent device that is a true pleasure to game (and work) with. I’ve reviewed the best five options currently on the market above, but how can you really pick the right model for you? First of all, you’re going to have to decide on a form factor. Most gaming laptops are available in both 15- and 17-inch sizes. Luckily, both offer the same amount of performance so you definitely won’t be missing anything performance-wise if you’re going with a smaller device. On the other hand, a larger display may offer a more immersive gaming experience. It’s also important to take a look at measurements and weights as a laptop is presumably something you’ll want to carry around once in a while. 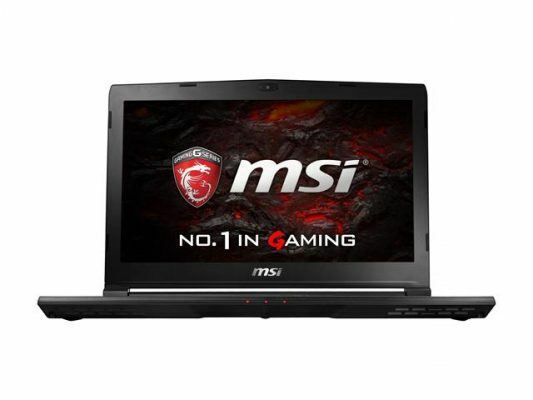 The 14-inch MSI Phantom Pro really stands out in this department providing a rock-solid gaming experience. The processor, internal memory and solid state drive combinations are mostly very similar which isn’t surprising in this price range. We’ve pretty much hit the ceiling with most components and no matter which device you pick, you’ll enjoy a blazingly fast experience. If you’re someone who also uses a laptop for other intensive applications such as editing, it would be best to pick a laptop with 32 gigabytes of memory or picking a notebook that’s easily upgradeable. G-Sync is another major selling point. The way G-Sync works is that it effectively eliminates all forms of screen tearing which ensures a perfectly smooth experience. What the GPU renders is exactly what you’ll see on the display with a 1:1 framerate. If you’re into fast-paced action titles G-Sync is definitely something to take a closer look at but it’s not particularly useful for other types of games such as MOBA. Nonetheless, it’s absolutely a great asset to have on a gaming device. A major benefit for both ASUS Republic of Gamers models. Do you want the best of the best? Go with a laptop that uses the very impressive GTX 1070 chip which effortlessly handles the most intensive games at 1080p, can manage very well in 4K-resolution (if you’re connecting it to a second screen for example) and is absolutely perfect for immersive and high-quality virtual reality. If you can recognize yourself in one or more of these situations, the Gigabyte P57Xv6-NE2 is probably the best option for you. 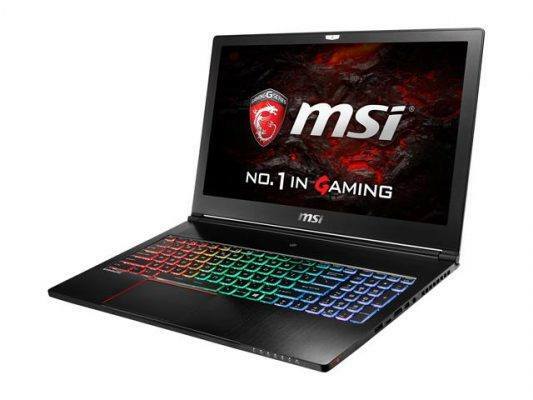 The market of gaming laptops is an extremely interesting one and is constantly evolving with features such as G-Sync, new graphics cards series such as the fantastic GTX 1060 and GTX 1070 and great-looking designs. Portable gaming done good. In case you’ve missed it, I’ve put together a list of the five best gaming laptops of the moment above with a detailed rundown of the most important specifications, benefits, and caveats. How do you feel about gaming laptops, do you have any additional comments or perhaps you’d like to suggest another gaming laptop that would fit great in this list? Let your voice be heard in the comments right below.